In the past, shingles were the go-to roofing material because they were simply the norm. Today, however, building owners recognize that metal roofing offers an attractive, long-term, cost-effective alternative to shingles. While a relatively inexpensive roofing option, shingles need to be repaired and replaced on a regular basis. And, building owners simply accepted the disadvantages of shingles, but that isn’t the case today. We recently wrote an eBook to help building owners and homeowners understand the differences between shingles and metal roofing. Our new eBook, Tired of Replacing Your Shingle Roof? 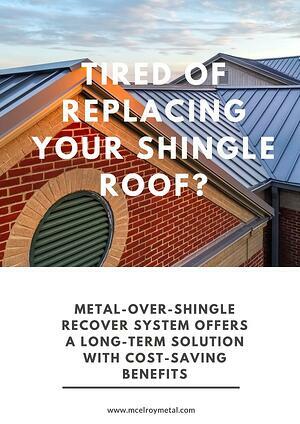 Metal-Over-Shingle Recover System Offers a Long-Term Solutions with Cost-Saving Benefits, was created to help building owners understand the options available to them. The eBook focuses on the longevity, durability, and environmental advantages of metal roofing over shingles. Follow the link below to download your copy of the eBook Tired of Replacing Your Shingle Roof? Metal-Over-Shingle Recover System Offers a Long-Term Solutions with Cost-Saving Benefits!